At the top of his class at Harvard Law, he hadhis choice of the best in America. He made a deadlymistake. When Mitch McDeere signed on withBendini, Lambert & Locke of Memphis, he thought heand his beautiful wife, Abby, were on their way.The firm leased him a BMW, paid off his schoolloans, arranged a mortgage and hired him adecorator. Mitch McDeere should have remembered what hisbrother Ray -- doing fifteen years in a Tennesseejail -- already knew. You never get nothing fornothing. Now the FBI has the lowdown on Mitch'sfirm and needs his help. Mitch is caught between arock and a hard place, with no choice -- if hewants to live. Long before his name became synonymous with the modern legal thriller, John Grisham was working 60-70 hours a week at a small Southaven, Mississippi law practice, squeezing in time before going to the office and during courtroom recesses to work on his hobby writing his first novel. That might have put an end to Grisham's hobby. However, he had already begun his next book, and it would quickly turn that hobby into a new full-time career and spark one of publishing's greatest success stories. The day after Grisham completed A Time to Kill, he began work on another novel, the story of a hotshot young attorney lured to an apparently perfect law firm that was not what it appeared. 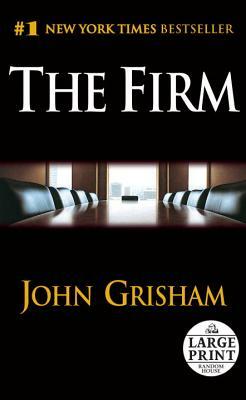 When he sold the film rights to The Firm to Paramount Pictures for $600,000, Grisham suddenly became a hot property among publishers, and book rights were bought by Doubleday. Spending 47 weeks on The New York Times bestseller list, The Firm became the bestselling novel of 1991. Grisham took time off from writing for several months in 1996 to return, after a five-year hiatus, to the courtroom. He was honoring a commitment made before he had retired from the law to become a full-time writer: representing the family of a railroad brakeman killed when he was pinned between two cars. Preparing his case with the same passion and dedication as his books' protagonists, Grisham successfully argued his clients' case, earning them a jury award of $683,500 the biggest verdict of his career. When he's not writing, Grisham devotes time to charitable causes, including most recently his Rebuild The Coast Fund, which raised 8.8 million dollars for Gulf Coast relief in the wake of Hurricane Katrina. He also keeps up with his greatest passion: baseball. The man who dreamed of being a professional baseball player now serves as the local Little League commissioner. The six ballfields he built on his property have played host to over 350 kids on 26 Little League teams. "From the Paperback edition."" "Taut, fast and relentless... A ride worth taking." -- San Francisco Chronicle. "Keeps the reader hooked... From the creepy first chapters... to the vise-tightening midsection and on to the take-the money-and-run finale." -- The Wall Street Journal. "Irresistable... seizes the reader on the opening page and propels him through 400 more." -- Peter Prescott, Newsweek.